I am the publisher and editor of Guyanese Online, a blog that gives free advertising to Guyanese organizations worldwide. Editor’s Note: I(Cyril Bryan), was on this plane on my way to Toronto from Guyana after spending three weeks with the CANGO Medical Mission to Indigenous Guyanese in the Pomeroon (Region 1) and Moruca (Region 2) areas of Guyana. This is my report on what occurred on the Fly Jamaica Georgetown to Toronto flight that crash landed. The flight was scheduled to leave at 1.30 am local time … 12.30 am EST on November 9, 2018. The plane was delayed for half and hour as there were problems with the door … it was not closing properly and the technicians were called. I was in seat 4C … right in front and could see what was going on with the door problem. Eventually we took off at 2.11 am 1.11 EST. It was dark so I could not see much outside the plane, but then lights appeared on the left side of the plane as we started descending to the airport. I travel by air often, and I felt uneasy about the sound of the engines, as the captain seemed to be using the engines to help steer the plane… a jerky effect and at one point he gunned the engines to keep the nose up….this was about five minutes before we landed. My prayer was that we landed on the tarmac and not the river or forest and be killed or injured. The pilots were very skilled… and I believe that they were bringing in an ailing plane that was difficult to control.. swaying from right to left etc. Congratulations to them. When we touched down we may have been some way down the runway…. 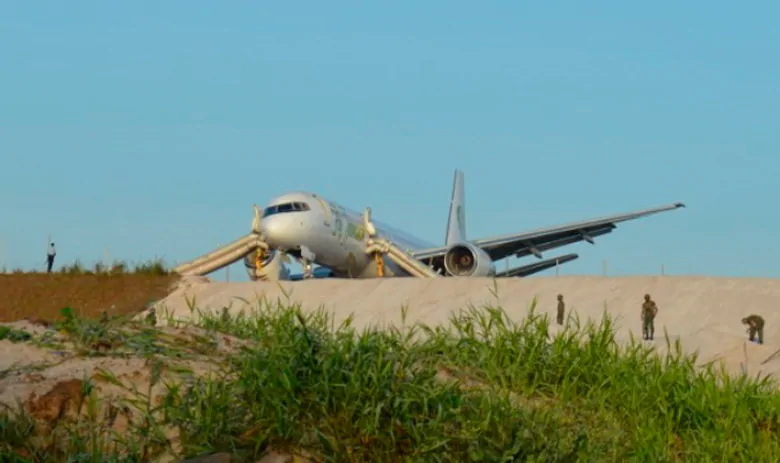 the plane’s brakes seemed to have partially failed due, most likely, to their hydraulic issues… But the plane did slow down a bit… .then it hit the end of the runway and some impediments that were put there … where the runway expansion was being completed. There were explosions on the right side of the plane.. maybe tires being blown out… then it swerved right breaking through a wire fence …before stopping just a few feet from a ravine, The front wheels were partly buried in the loose sand and that may have stopped the descent into a ravine. In the darkness I did not see the deep ravine that was close to where the plane stopped. That BBC report stated that ..
“We crashed into a big sand pile at an edge of a cliff. There’s a big drop about 30-40 feet [nine to 12 metres] on the other side. If we had 10 more feet [three metres], we would be down in the ditch,” he said, adding it’s a “miracle of miracles” that no one was more badly hurt during the crash and subsequent evacuation. There was a loud crash and thud as the plane stopped. The slide chutes or exit ramps were quickly deployed and passengers left the plane quickly helped by the cabin crew personnel. There were a number of persons… at least 12 .. who used wheelchairs to get to the plane when we were boarding… and I was concerned about them. Eventually they were removed safely as there was no fire initially. Later a small fire was noted on the broken right wing and engine and the fire engines went into action. By that time most of the passengers , if not all, were out the plane. Luckily the plane was only about 60 -70% full (120 passengers plus 9 crew), so that helped with the speedy exit of the passengers. After sliding down the chute we had to get through the perimeter fence .. barbed wire etc… to get back on the runway. When I got on the runway I saw the damage with the aid of the lights of the fire engines. The main fuselage seemed to be intact but the right wing and engine as well as the undercarriage (wheels) were ripped from the plane. As there was no fire the fire engines did not go into action up to the time I started walking to the terminal. It is obvious to me that the pilot dumped most of the fuel before landing. If he did not, the plane would have burst into flames. We were assembled at the Departures Terminal, some distance away… some persons were taken on airport vehicles. Guyana airport personnel, firemen and Fly Jamaica airline personnel were many to help the passengers. Everyone, including the passengers in wheelchairs, got to the terminal departures area and we were all glad to be alive and that there were no serious injuries. A passenger list was printed out and all passengers were accounted for. The “injured” persons I saw entering the ambulance later (around 6.30 am) all walked to the vehicle, to go to the Diamond Hospital… no stretchers. Since it was early in the morning and an emergency, some issues like transport arrangements etc were not in place…. however, some persons were told to take taxis or buses and submit their charges to the airline. Only with the light of dawn were we aware of how close we were to that ravine and how close we came to be a statistic of airline tragedies. The plane is a total wreck with right wing almost severed and both engines severely damaged, the right engine completely severed. The right-side wheels were completely ripped off as well. The luggage compartments did not seem to be badly damaged. However, no baggage was immediately taken off the plane so persons were told to call or await calls from the airline to collect their luggage. My suitcases was collected on Saturday November 10, from the Fly Jamaica / Wings office at the Georgetown Eugene F. Correia Airport. We thank the universe for saving us to live another day. The pictures below will give you an idea of the damage to the aircraft. Thanks to everyone who has written me personally and wished me the best. Exit ramps … I exited here then had to get through barbed wire fence away from the plane. Thank the Lord for the pilots Cy. Glad you can wake up to another morning. God bless. Cyril: Thank you so much for your detailed report on this incident. We thank God for keeping you and everyone else safe … and still alive. Elizabeth Abdool (Director, Guyana Christian Charities (Canada) Inc. I am horrified to learn of this near-tragedy. It is one of aviation’s ‘good news’ stories under dire circumstances. I am glad that everyone made it out alive, and I am especially glad that you are back home, safe and sound. I cannot imagine the horror of those frightful moments, which must have felt like an eternity. 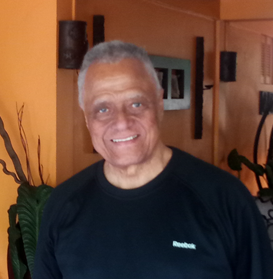 Your humanitarian mission to Guyana’s interior is commendable and beyond and above the call of duty. And thank you for sharing this bone-chilling story. It was not your time. Thank you Ron for your comments. If the plane had gone over the cliff and into the ravine, it would have been a real disaster. I am truly thankful that we have all been spared. I look forward to doing more work in the Pomeroon and Moruca River areas of Guyana, with special focus on health and education. I hope that reader will help to support my projects when they are launched in 2019. 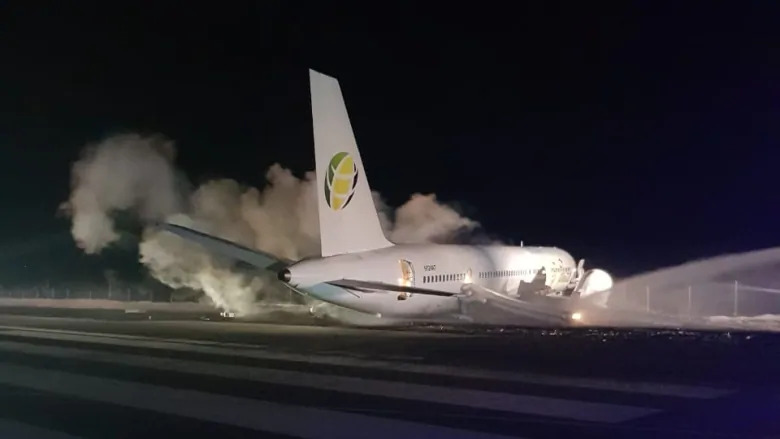 Aviation officials have given Fly Jamaica the green light to remove the Boeing 757 which was forced to make an emergency landing at the Cheddi Jagan International Airport (CJIA) minutes after takeoff on Friday. And the pilot, Captain Basil Ferguson, is being credited with averting a major disaster after stopping the plane inches from a steep drop at the end of the runway. Kaieteur News understands that Ferguson has many years of flying experience and was previously employed with Air Jamaica. Several passengers who spoke with Kaieteur News following the incident said that Ferguson should be praised for his effort to save the lives of the 128 persons onboard the aircraft. According to health officials, about ten persons sustained minor injuries while deplaning from the crashed craft. The Fly Jamaica flight departed CJIA at 2:10 a.m. for Toronto, Canada. 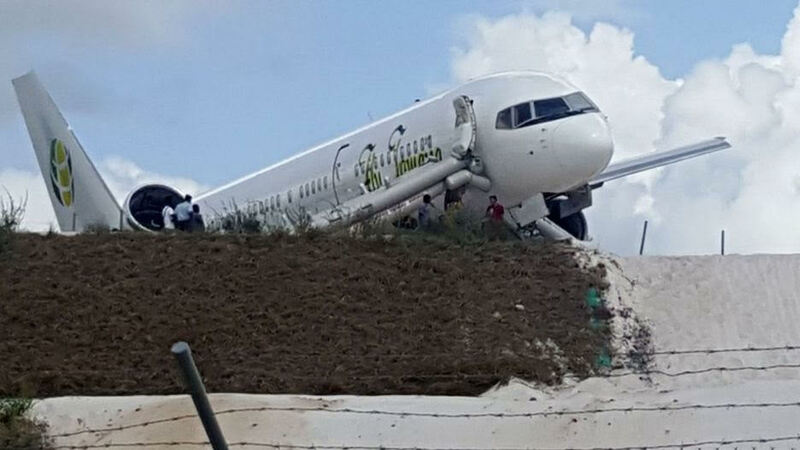 About 15 minutes into the flight, passengers recalled that the pilot reported that the aircraft was experiencing problems with its hydraulic system and needed to return to CJIA. According to flight maps, the airplane circled before attempting to land. Passengers recounted that upon touchdown, the aircraft sped past the airport’s terminal, past the end of the existing runway and onto the newly extended portion of the runway, which is not officially open. I did not realize you were on the Fly Jamaica plane — just read it. I am glad you all are okay. God is good. 1. I live in Toronto but I usually spend the winter months in the Caribbean. 2. I am also a citizen of Guyana. I emigrated to Canada in 1966 to attend York University. 3. I started a blog guyaneseonline.net nine years ago. It has almost six million views to date. Most of the readers are from The USA and Canada. 4. The focus of the blog is to offer Guyanese organizations worldwide free advertising for their events, their newsletters etc. 5. The blog also offers articles on a wide range of subjects that are not specifically relating to Guyana. 7.As noted above, I emigrated to Canada 52 years ago but I only visited a few times. My last visit was 2004, but my blog gives me and my readers Guyana news as well as stories and commentaries on various subjects by Guyanese living abroad. 8. One of the organizations I feature in my blog is CANGO. I went on this trip to be with their medical teams as they serviced the medical needs of people in relatively remote locations in Guyana. A report on their mission in 2017 is here. It will give you a good idea of why I was there to witness their work this year. This report on their 2017 mission and their FaceBook page will give you an idea of their work in Guyana that focuses on Indigenous peoples in the interior regions of Pomeroon and Moruca in the Regions 1 and 2 of Guyana. These locations are only accessible by river transportation…. I have photos, but there are a number on the CANGO Facebook page. ..Regular Reports are on the CANGO FaceBook Page, which has photos. 9. On this 2018 mission I helped with the registration of over 1500 patients in the two weeks at various locations. Most of the volunteers on this mission are doctors and nurses from Canada and the United States. My reports will feature the history, social conditions. education and health facilities as well as the culture of these communities many of which go back for thousands of years. 11. I was on my way back to Toronto to begin writing the series of articles on the various locations I visited when the mishap occurred with the Fly Jamaica plane. 12. I have updated my story and published it on the Guyanese Online blog. You can view it here. We met at project Dawn. I am the Anesthesiologist from WI. USA. I am so thankful you were not hurt in that plane. I heard about it in the news, and I just read your report. And thanks for the news letter. Sometime back an individual sent me one of those jokes that people usually circulate on social media. It was about a bird that collapsed on the ground during extremely cold weather. Up came a cow and dumped on it. The mess kept the bird warm. The joke continued that not everyone who dumps on you is an enemy. The bird felt good, so it began to sing. A cat heard the singing and investigated. It dug the bird out of the mess and ate it. The morale is that not everyone who takes you out of mess is your friend. This joke came readily to my mind when I read that fourteen firefighters raided the crashed Fly Jamaica flight after it landed at the Cheddi Jagan International Airport on Friday. You makin’ Joke – Dat’s no joke! Teenager Ye Meng Yuan didn’t die when a plane crashed at San Francisco International Airport last July. She actually survived the impact, only to die minutes later after a fire truck ran over her. Now, newly released video suggests emergency workers saw Ye’s injured body on the ground before she was fatally struck — challenging earlier claims that she was accidentally run over because she may have been covered in firefighting foam. Just saw your report on the plane crash. I am very glad you in particular and the other passengers are ok.
and all others survived well. I am wondering as to why the pilot did not dump the fuel prior to landing. challenges of operating the company. Normal for this type of business. pilot’s panel prior to take-off. the hydraulic malfunction will be determined. In regard to the pilot not dumping the fuel… It is my belief that he did so … if not there would have been an explosion as the fuel ignited when the right wing and engine as well as the undercarriage (wheels) collapsed and broke off. Very little fuel was in that plane…as the small fire I saw afterwards was quickly doused. The problems with the hydraulic systems were quickly noted and announced about 10 minutes after the plane took off. The plane did not climb to 32.000 ft as the pilot announced on taking off but stayed level at about 10,000 ft. The flight path also shows him returning to the airport and circling a couple of times before landing…. most likely to burn off some of the fuel. I just received my Guyaneseonline and read about the crash. It’s an opportunity to give thanks that Providence, through the skillful pilot, spared the lives of you, your fellow passengers, and crew. I also give thanks that no one was seriously injured, especially those who were wheel-chair bound. It is a sober reminder that as much as air travel is routine for many of us, we should never take for granted what a miracle it is. I don’t know whether you’re back in Canada or still in Guyana, but I offer thanks again that your number has not been called, even as we are about to fly elsewhere for the holidays. Hello Cyril, Thank God that Fly Jamaica plane land safely with all passengers..and yourself. Amazingly God was on that plane …Thanks for all the pictures and info. I know someone that was on that plane. An elderly lady and she is critical in the hospital. her 4 children flew down a couple nights ago to be with her. I contacted Jerry Triesman last Friday, to ascertain if Yvonne and the team were on the flight. He informed me that you were on the flight. I informed your cousin Edward. Just read your detailed but terrifying account of the crash. Very happy to learn that you came out of it unscathed and that there were no serious injuries to those on board. There is an old movie titled “God is my co-pilot”. No doubt he was there with you all. Rookhai Kalloo, the 86-year-old passenger who suffered a head injury while exiting the crash-landed Fly Jamaica aircraft, succumbed yesterday. Kaieteur News understands that Kalloo, who had suffered a fractured skull, passed away at the Georgetown Public Hospital at around 13.00 hrs. She was initially being treated at a private hospital. Reports indicate that Mrs. Kalloo struck her head while coming down the emergency ramp of the aircraft. The elderly woman, her daughter, and granddaughter were among the passengers on the Canada-bound aircraft which was forced to land at the Cheddi Jagan International Airport two Fridays ago. According to officials, Fly Jamaica flight OJ256 had departed CJIA at 2:10 a.m. for Toronto, Canada. 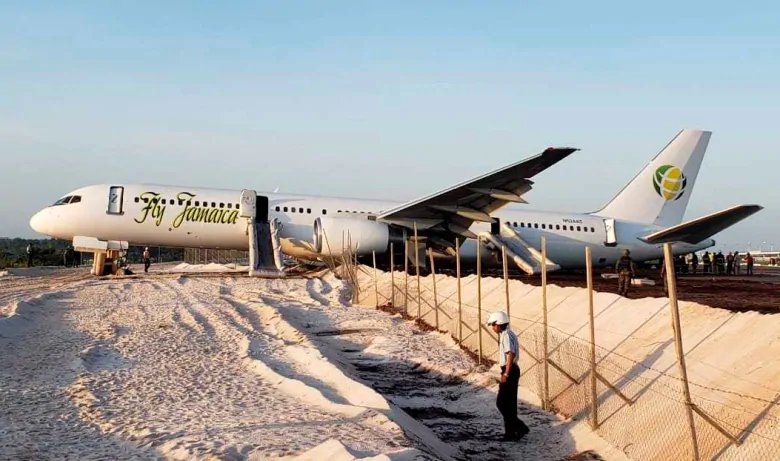 About 15 minutes into the flight, passengers said that the pilot reported that the Boeing 757 was experiencing problems with its hydraulic system and needed to return to CJIA. Onboard were 120 passengers, including two infants, and eight crew members, which included six Guyanese cabin members and two Jamaican pilots. In total there were 35 Guyanese, one Trinidadian, 82 Canadians, one Pakistani and 11 American citizens on board. The pilot, Captain Basil Ferguson, is being credited with averting a major disaster after stopping the plane inches from a steep drop at the end of the runway. Rookhia Kalloo, the eighty-six-year-old passenger who suffered a fractured skull following the crash-landing of a Fly Jamaica plane at the Cheddi Jagan International Airport last Friday, has died. A family member confirmed to Stabroek News that the woman passed away at the Georgetown Public Hospital yesterday afternoon. It was previously reported that Kalloo, who was initially admitted to the Woodlands Hospital on Monday, had suffered a skull fracture, which caused her brain to swell. It is suspected that she was hit on the head at the time of the crash landing. Kalloo, her daughter, Lilawattie Persaud, and her granddaughter were among those aboard Fly Jamaica flight OJ 256, which had been en route to Toronto, Canada, when it experienced hydraulic issues, resulting in the pilot making an emergency landing. Doctors at the Woodlands Hos-pital indicated to the family that there was nothing that could be done for Kalloo. Due to the cost to continue to keep her at the private hospital, the family moved Kalloo to Georgetown Public Hospital, where she succumbed. Persaud told this newspaper that her mother had been very hysterical after the accident but did not complain of having suffered any injuries. Hours after returning home from the airport, the daughter recalled seeing her mother being disoriented. After being questioned about her health, Kalloo told her daughter that she was not feeling well. As a result, a decision was made to take her to the Woodlands Hospital, where she was immediately admitted. Since the accident, Persaud said her mother had lost the ability to speak and move on her own. “She went to sleep but woke up different, the last time I heard my mother speak was on Sunday when I asked her if she was okay, but now she totally shut down… the doctors said that her brain is swollen and that it is shutting down and that there is nothing else they can do for her,” Persaud shared. At the time of the accident, Kalloo, her daughter and granddaughter were returning to Canada after vacationing here for four weeks. Pilot Basil Ferguson’s heroics saved hundreds of lives. The lucky survivors owe him a huge debt of gratitude. They came within a whisker of death. Sad to hear about the passing of the elderly lady.